Clear Brine Fluids Market size was valued at over USD 870 million in 2015 and will witness gains at 5% CAGR by 2024. The global clear brine fluids market size was primarily driven by increasing product usage in the oil & gas industry. It is widely used in drilling activities and completion processes. These fluids are used in the conventional drilling to control the high-pressure and high-temperature formed in the reservoir and thus reduces the damage risk. Escalating oil & gas sector along with increasing number of rig counts will substantially contribute to propel the global industry growth by 2024. For instance, the global oil rig counts in 2013 were roughly around 15 thousand and is forecast to exceed 20 thousand over the estimated period. Shale gas discovery in the U.S. has catalyzed the oil & natural gas industry. For instance, the shale gas production in the U.S. was roughly around 3 trillion cubic feet in 2009 and reached approximately 9 trillion cubic feet in 2015. In addition, the industry is likely to follow similar trend in the coming years, which will subsequently drive the overall clear brine fluids market share by 2024. Depleting natural resources including crude oil and natural gas has widened demand-supply gap in crude oil & natural gas and has drifted the industry focus toward development of unconventional resources such as shale oil/gas, coal bed methane (CBM), tight gas, and gas/methane hydrates. Furthermore, escalating oil & gas industry on account of discovery of massive shale gas reserves in Russia and China will complement the clear brine fluids market share over the estimated period. The global clear brine fluids market share was led by potassium chloride in 2015 and is forecast to experience maximum over the estimated period. The segment was valued more than USD 150 million in the same year. These fluids are broadly in the oil & gas industry for stabilizing water-sensitive clays from the excessive pressure formed in the reservoirs during drilling and completion process. It is also preferred in the industry on account of economic benefits. The fluid is considered as a cost-effective potassium source used in drilling and is thus preferred in the industry. U.S., UK, Canada, and Australia have been increasing investments towards energy security in the recent years. Shale reserves exploration is the major steps in achieving energy security over the projected timeframe. This trend has resulted in increased product demand in drilling and completion activities, which will subsequently propel the overall clear brine fluids market size by 2024. 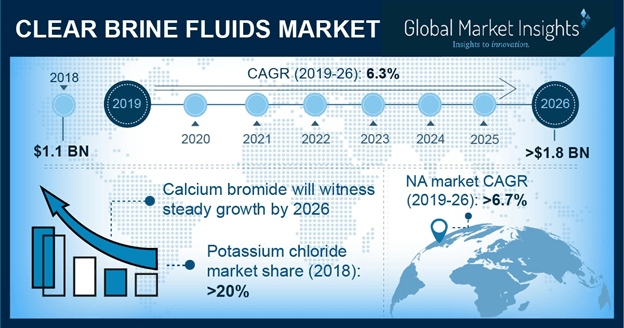 Calcium bromide clear brine fluids market size is likely to observe gains close to 5% CAGR over the projected timeframe. These fluids are used in various applications including workover fluids and completion fluids. In addition, these are used to minimize the damage caused by formation pressure owing to their inhibitive properties. North America, mainly led by the U.S. clear brine fluids market size was valued more than USD 550 million in 2015. Increasing product usage in the region particularly due to massive shale gas reserves in the U.S. will positively influence the industry growth by 2024. Furthermore, increasing U.S. government towards enhancing their energy security will complement the regional business growth in the coming years. Asia Pacific, particularly China, is likely to observe highest gains close to 6% CAGR between 2016 to 2024. China accounted for over 15% of the global recoverable shale gas in terms of volume in 2015. This is the prime factor propelling the regional clear brine fluids market size over the estimated period. Middle East & Africa clear brine fluids market size is likely to surpass USD 150 million by 2024. Shale gas discovery in South Africa and Algeria will stimulate product usage in the region, and thus will boost business growth by 2024. Middle East & Africa (MEA) is one of the major oil & gas industry share contributor. Prevalence massive crude oil reserves in the West Africa, Gulf countries is the prime factor propelling product applications in the region. However, political unrest in MEA countries including Libya, Syria, and Egypt has significantly impacted the crude oil prices in the recent years. for instance, the global crude oil prices as of January 2012, were close to USD 110 per barrel and declined to over USD 40 per barrel in 2015. This trend is likely to obstruct the overall clear brine fluids market size by 2024. Nevertheless, never ending energy demand via crude oil and unconventional gases will stimulate the product demand and thus will boost the industry growth by 2024. The global clear brine fluids market share was highly consolidated with top six product manufacturers accounting for over 30% of the overall industry share in 2015. Some of the industry share contributor includes Israel Chemicals Ltd., Albemarle Corporation, TETRA Technologies Inc., Egyptian Mud Engineering & Chemicals Company (EMEC), Geo Drillings Fluids, Inc., Zirax Ltd., Solent Chemicals, Halliburton and Chemtura Corporation. Major industry share contributors are involved in strategic mergers and acquisitions in order to strengthen their presence. For instance, in 2012, Chemtura Corporation acquired the bromine assets of Solaris ChemTech Industries Ltd. to enhance its position in bromine and bromine derivatives industry along with expanding its presence in Asia Pacific. Clear brine fluids are salt-based fluids that are used in drilling and completion processes. Chief raw materials used in the production of clear brine fluids include elements such as calcium, potassium, sodium, cesium, chlorine, and bromine. The industry ecosystem of the clear brine fluids market share involves raw materials, product manufacturers, distribution channels and ultimate end-user (oil & gas sector). Positive growth indicators in the natural gas industry along with shale gas discovery in the U.S., Russia and China is the major factor propelling industry growth. Wavering crude oil price trends will negatively impact on the clear brine fluid market price trends.